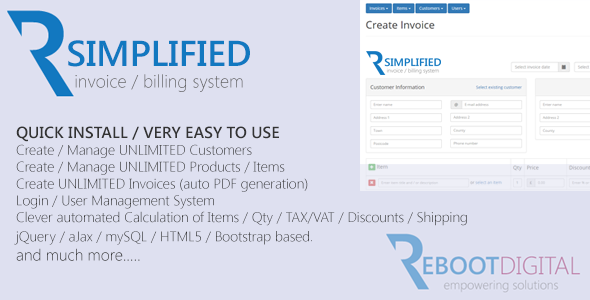 A simple and fast invoicing / billing solution using the bootstrap templating system, it enables you to create products and items, create customers, users, invoices, quotes and receipts. It also has some other great features one of which is instant invoice calculations for items, quantity, discounts (fixed or percentage) sub-totals, shipping, Taxes / VAT and totals with no effort what so ever! It can be used for any type of invoicing from eCommerce invoicing, general in-house invoicing to product and services invoices. There are plenty more features within the system so checkout the demo or have a look below to see its full potential.